THERE is nothing like the threat of a killing frost to get a gardener hopping. Although my potted plants were brought indoors long ago, I had neglected — at least until I heard tonight’s forecast — to lift my cherished lemon verbena, parsley, petunias and geraniums (like ‘Apple Blossom Rosebud’, above), from their vulnerable positions in the open garden. Read on, if you’re not too squeamish, and I’ll show you my surgical procedure that permits the successful overwintering of these tender herbs and annuals. If there is one thing plants can’t stand, it’s to have someone meddle with their roots. 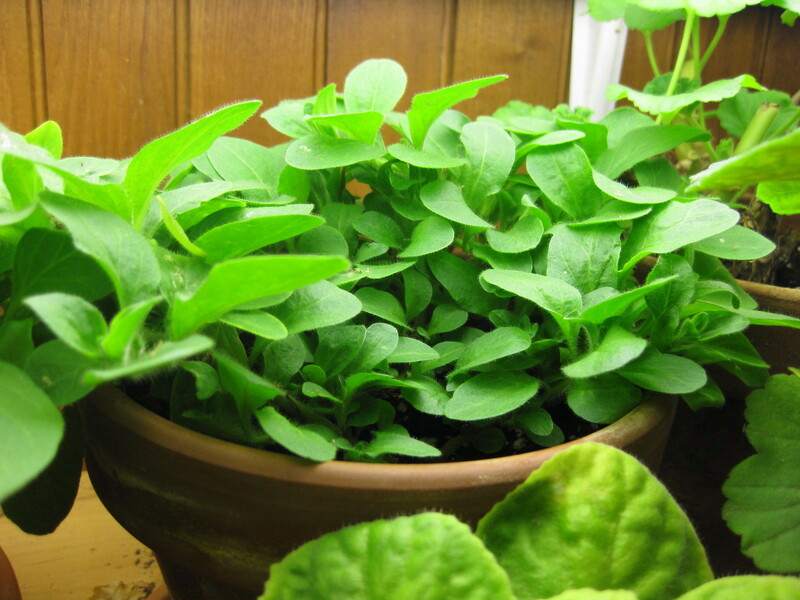 But when you need to pot an herb like parsley that has been growing in the open garden, or a petunia that has prospered for months in a 12-inch hanging basket, root-manipulation is unavoidable. The goal is to get these monstrous growers into pots that are small enough to fit in a window, or on a shelf beneath fluorescent lights. And to do this, roots must be trimmed off, and usually rather severely. After digging up or “lifting” a plant, I cut away one half- to two-thirds of its root system — enough of the roots, in fact, to enable potting into a 4- or 5-inch pot. Then I remove most of the top growth to accommodate the reduction of roots. 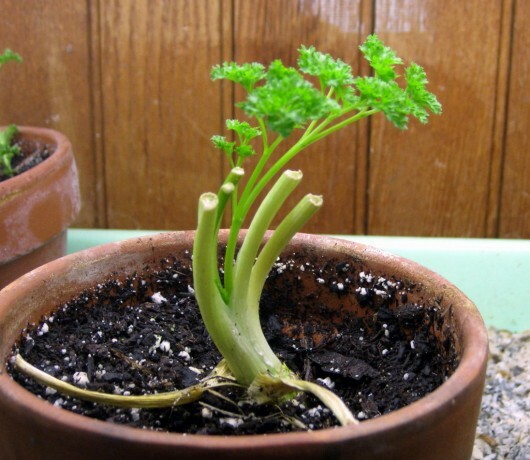 Parsley (above), requires additional cutting, because it grows not from a stem, but from a crown. I cut rooted sections of the crown with a sharp knife, which always results in a number of new, house-sized plants. Even after this traumatic surgery, recovery for parsley is quick. Under good light and cool temperatures, new growth emerges in about one week (below). With zonal geraniums (above), it is my policy to reduce the foliage to three pieces of three inch growth. Even with good light and cool temperatures (60 degrees is better than 70), these plants suffer such a shock from the root-cutting ordeal that they rarely bloom again before May. If you want geraniums to bloom in winter, the best plan is to grow new plants from stem cuttings taken in May or June. Petunias (above) are cut back to within three inches of their lives (I trim the roots, too, in order to fit the plant in a 5-inch pot). In my fluorescent light garden, new growth resumes with lightning speed (below). 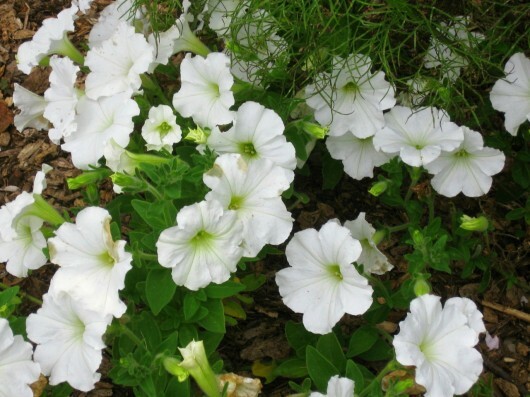 I feed petunias regularly with a high-phosphorous formula (1/4 teaspoonful to a gallon of room-temperature water), and they bloom from December on. You can propagate petunias from stem cuttings, too. Just follow these simple directions. Lemon Verbena can be overwintered exactly like a geranium, except it demands extra humidity after potting. A clear plastic bag set over the plant for two weeks helps it to adjust to house life. WARNING! Once you have lifted, cut, and potted a number of non-hardy plants, you will feel like a professional horticulturist. You will also feel like a hero, because you’ve saved your cherished garden herb or beloved flowering annual from the fatal fingers of frost. If you have any questions about overwintering your plants, please post them in the comments section below. I’m all ears! Heroism, indeed!!! Where do you keep all of these plants over winter? Carol – After the root and foliage “surgery” is accomplished, the plants fit into small, 4-inch pots. They really don't take up much room. And, I outfitted several of my windows with glass shelves (see September archives), which permits many more plants to be grown in a single window. You can do this too…it's not hard. I promise! Kevin, Thanks for the advice. I had planned to give Jack Frost my $40.00 hanging basket petunia, but now I've changed my mind. Guess I'll knock it out of the basket, reduce it to a small plant, and grow it on in a window. Then I can take cuttings from it in late winter, and start another hanging basket – for free. It's a purple variety, and very, very fragrant. Do you prefer curled leaf parsley to flat leaf? I've read that flat leaf is the more flavorful of the two. Gardenlady – Lots of people prefer the flavor of flat-leaf parsley. I happen to like the curly type…for its decorative quality! Kevin, what a great and helpful site. Can you find a way to share it on Facebook? Excellent tips. We've had frost here, but my geraniums look no worse for it. Should I dig them up or is it too late? GothamDan – I would like to share this blog on FB, but my FB page is SO cluttered that I rarely even look at it. I'm sure there's a way to manage it better. Holly – It's not too late to overwinter your zonal geraniums. Better get hopping, though – they can only survive temps as low as 26 degrees! Quick question: I live in zone 8 and would like to overwinter my annual flowers in pots. Can I just bring in the pots as they are or do I need to cut the geraniums, petunias, etc out of their pots and repot like you suggested? Hi Kevin, I am so happy to see help at hand on your website. I am from India and it's my first year here in PA. Everything is very new especially how to care for plants in extreme winters. My question is – Can I overwinter coleus and Impatiens? I am afraid it may be too late already… all their leaves are gone but I think there is still some life in the stems… help…. Karmen – Welcome. If your annuals are already in pots, and roots are not growing out of drainage holes, you do not have to repot (unless you want smaller plants). Just cut tops back to 2-3 inches. Given plenty of sun (or fluorescent light), cool temperatures and humidity, regrowth will begin almost immediately. nidhijain430 – nice to meet you! If all the leaves are gone from your plants, there is little chance they will survive indoors. However, if there are a few leaves at their very tips, simply take cuttings, and root these in pots of moist vermiculite or soil. In good light they will grow roots and become marvelous wintertime houseplants. I have a lot of my herbs in pots outside, including parsley. Can I just bring the pots in-without doing the surgery? Although the pots are big-I have room in my sunroom. Katreader – You have a sunroom? I'm SOOO jealous! Although it's work, I'd still perform the rejuvenating-surgery. You'll probably get 8 or more young, vigorous plants from a very tired and very rootbound pot of parsley! In general, potted plants are exhausted by summer's end. Consequently they tend to fail after a month or so indoors. Well, that's been my experience, anyway. Thanks! I have a few more days of vacation, so I'll try to get some gardening done. As for my sunroom. Sigh. You wouldn't be as envious if you saw it. Now YOU could probably work miracles with it…me, I'm a bit lazy and it's mainly a place for storage and a few plants! Can you bring herbs indoors for the summer? I have alot of thyme, lavender, oregano and sage in pots. Do they need the cold dormant period to do well? Lisa – The herbs you describe do not require a cold, dormant period. However, such plants by now are exhausted (and rootbound); if you bring them indoors without the rejuvenating-surgery described earlier, they are bound to disappoint. Hence, cut equal amounts of roots and top growth. Then repot into smaller quarters, using fresh soil. Provide them with good light and cool temperatures, and they will quickly reward you with strong, vigorous growth. And, they will continue to flourish all winter long. Your newsletter was right on time for me. I have a lemon verbena in a pot and was wondering if I should bring it inside. Last year it was in the ground and came up on its own this spring and thats when I put it in the pot because I read it could take over the yard (like a small peppermint plant I had did!!!) I almost killed it forgetting to water it, but it jumped right back. Terry – Glad to help. Lemon verbena is probably my favorite summer herb — I could swim in its citrussy scent! Oh I just reread the label, it is actually lemon balm. Almost the same thing I think. Hi! When you cut back the geraniums, do you continue to water them? I heard that you should cut them back then only water a couple times during the winter so that they go dormant. It looks like you have a different method, though, since you want them to bloom while inside? Julie – welcome. I feed and water my geraniums throughout winter because I wish to keep them growing. If you want to encourage dormancy but not death — set the plants some place cool and dim (not dark), and provide just enough water to keep the soil from completely drying out. You'll have a better success rate, however, if you keep the plants growing in a south or east window. 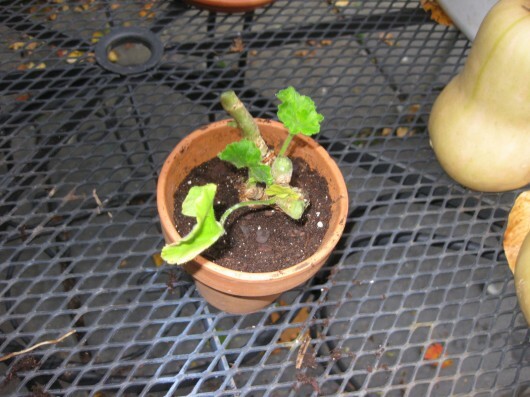 Can I save my Sweet Potato Vine the same way you did the geraniums? They are so hard to find in the spring, I'd like to keep them alive. Also, how can I multiply them? Is that possible? Thanks for sharing all your info. Anonymous – Sweet Potato Vine is very easy to propagate from stem cuttings. 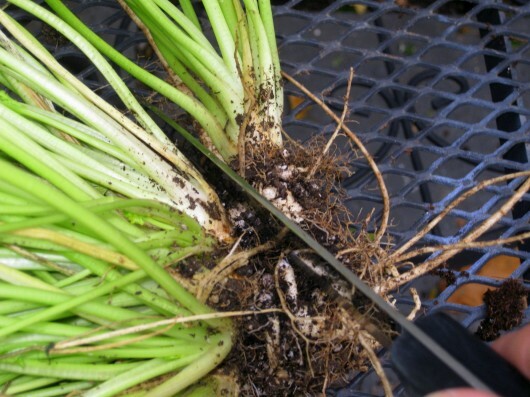 Take 3-inch-long cuttings (from tips or side-shoots) and root them in 4-inch pots of soil-less mix. Keep the mix moist but not saturated, and the stems will grow roots in about 2 week's time. In a sunny window these new plants will grow like gangbusters! Maybe you can plant them in a pair of pots, and use them — as I did with philodendron — to frame a window garden. I haven’t kept up with all your articles. Do you re-pot with commercial potting soil or garden soil for overwintering? Hi L Hardy – For repotting, I sometimes use my own, finished compost, amended with perlite. But any commercial mix (these usually contain peatmoss and perlite) will do. I have a non-stop flowering begonia. Any suggestions/tips on wintering it over? Hi LaTrice – Are you referring to Begonia semperflorens — the waxy-leaved Wax Begonia? It is one of my favorite plants, and a cinch to keep in winter. More details here and here. Thanks Kevin. That’s exactly the information I needed. Can I ask about over wintering Rosemary? Hi Martha – In my experience, rosemary is tricky to keep over winter. The plant wants really cool temperatures (45-55 degrees), humidity in the 50-60 percent range, minimal water, and full sun. In a too-hot, too-dry atmosphere, the plant will drop all of its needle-like leaves. It is a finicky plant! Kevin, I have a question. I planted some Artichokes on a whim this year that I spotted where I buy my plants, . They have grown quite well but they did not produce. They are labeled as “tender Perennial”. I am in zone 6. Can you give me pointers on how to protect them over the winter? I didn’t get them set out very early in the season so I don’t think they had enough time to produce. Let me know if you think I can overwinter them and possibly get some tasty Artichokes next year. My coworkers were all excited when I said I planted some and made me promise to share if they produced. I had no idea you could grow them here. Thanks for any advice you can give me. Hi Deb – Artichokes may or may not survive the winter in zone 6 — it all depends on how harsh or mild the season is. In any event, well before freezing weather arrives, cut the plants back to about 12-inches. Then mound leaves, pine needles, or chopped straw (I recommend salt-hay-substitute — it’s virtually free of weed seeds) over the plants. Keep the covering in place until spring arrives, and freezing weather has passed. With luck, you’ll have terrific production next summer. I’ll keep my fingers crossed for you. Thanks Kevin, that was what I was thinking I should do. They are locally grown transplants so maybe they will survive. I will cut them back, mulch and hope for the best. I only planted 4 plants, one did not survive the summer but the other three did ok. One of them is quite large and I was hoping it would produce this year but time is running out. We are expecting lows in the upper 30’s to low 40’s Sunday night., so the growing season for them is gone. Thanks so much for your expert advice. You have opened up a whole new love of gardening for me. I always loved it but now even more. Hi Shannon – I set the plants in small pots in order to restrict their growth. No room for monster-sized house guests around here! Also, small plants have no need for large containers. Too much damp soil around roots can lead to fungal issues. hi, kevin, would this “surgical procedure” work with a basil plant? or is their adversion to cold, especially in our new england winters when the thermostat may be set low at times, make them a bad candidate for overwintering in a pot as opposed to being pesto’d & frozen? Hi Kevin! We have had a beautiful late summer here in the Pacific NW but the nights are cooling off fast. Since see very little snow, a heavy mulch may or may not be enough for some of my new plantings (and I have been busy this summer with my new-found inspiration from your website…thank you!). Here’s what I’ve got: rhubarb, well started (about 12″ height/width), a large to ust basil plant unlike anything I’ve ever seen (24″+ height/width! ), dwarf blueberry bushes (18″ presently) surrounded by small plantings of allysum and super petunia (small variety) that I hoped to encourage as a ground cover (bed is well protected from wind-chill and has full sun). Also planted a 40′ double row of strawberries which have been eaten back by the deer at our place but they do look to have new growth already happening. Weeds abound here in this bed, so I am planning on giving it a very heavy mulch…do in dare throw manure on too? I have lots of it! Thank you so much for giving me a whole new life with my garden Kevin…I am loving it! May I brag a bit here, – I have an Impatens plant that I love to show off – it was given to me for Mother’s Day in 1998. The plant is 15 in tall with a 30 in spread After reading your information I’m wondering should I repot it since it’s in the original container? or, since it’s still healthy don’t disturb it???? I also had an Appleblossom geranium that out of curiosity alowed to grow as tall as it wished. At one point is was over 7 feet tall but broke in half when I moved it to another room. It recovered and and grew again, but it looks too scraggly to keep it in this form so cuttings are in order. Heartfelt thanks for letting us mere mortals see your magic in action. Love spending Monday mornings with you. Andrea – Basil can be tricky to grow indoors — it wants heat, but it also wants humidity (indoors, humidity plummets as the temperature rises). Other herbs are not so fussy. I’ve had great success growing parsley, oregano, thyme, marjoram, and even chives under the lights on my kitchen counter. Meeri – What a great project you’ve started. In regards to manure, you can certainly use it in beds, providing it is thoroughly composted. For mulch, rely on shredded leaves, pine needles, chopped straw (I prefer something called “salt hay-substitute” — it is virtually free of weed seeds), or thoroughly composted, finely-shredded wood chips. And have fun with your garden! Hi Jingles — What a sight that impatiens plant must be! If the plant looks healthy, and if its roots are not growing out of the drainage hole, I see no need to repot. As insurance, I’d take a few cuttings from the plant. 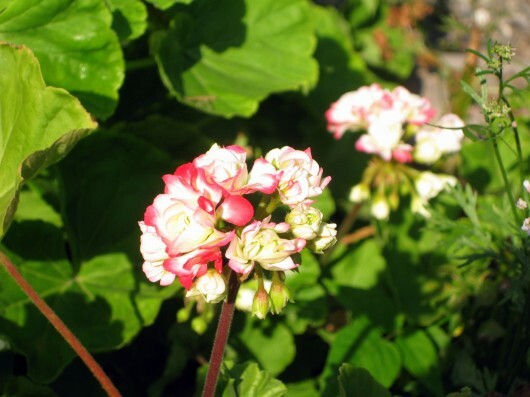 Also – nice to meet someone who is familiar with Pelargonium ‘Appleblossom’! Have some magnificent coleus growing outdoors – which of the techniques above would you recommend for them? Hi Jann – I always take cuttings from coleus plants. Stems — 2 or 3 inches in length, and their lower leaves removed — root practically overnight in 4-inch pots of well-draining soil mix. Use one stem per pot (coleus, as you know, is a mighty grower). To produce a bushy, not lanky, coleus, be sure to pinch off new growth for the first month, and thereafter as needed. And enjoy this dazzling houseplant all winter! I bought a cute little pot of fiber optic grass this spring and it has grown but is still in the shallow terra cotta pot I had it in all summer….I’d like to save it for next year….can I just bring it in or should I trim it back? Thanks for your wonderful column. Hi Barbara – You can definitely overwinter fiber optic grass indoors. Set the plant in a south- or east-facing window. Full sun and plentiful moisture are its only requests. Kevin – Thank you for this post! Very helpful! I’m going to try and overwinter my geraniums and some herbs. One of the problems I struggle with when I bring a plant indoors are some of the little friends that come along – primarily aphids – and flourish indoors. A plant will be fine then a week down the road I’ll find that I have an aphid infestation. Any advice on how I might avoid that problem? Hi Carol S. – Before I bring my herbs indoors, I give them a firm blast of water. Water is the quickest way to dislodge aphids and other pests from plants. The vacationing philodendron, geraniums, and other houseplants receive the water-blast, too. But I go a step further with the non-edibles: I spray them with House & Garden Raid. This way, pest epidemics are avoided during the outdoors-to-in transference. Hope this was helpful to you! I have a question about over wintering geraniums. After you prune them back how do you care for them, do you let them dry out or do you keep them damp and cool? How about basil or snapdragons? Will this work for them? Jean – After cutting the geraniums back, I place them in the south window of my music room. There, they flourish in full sun and cool temperatures (55-65 degrees). I water them whenever the top 1/2 inch of soil becomes dry. They receive a little food with every watering — one 1/4 tsp. of a low-nitrogen/high-phosphorous formula, dissolved in a gallon of room-temperature water. I pinch out the first new growth in order to produce strong, bushy plants. Sarah – Snapdragons are half-hardy annuals. One autumn, I cut my tall snaps back to 6 inches. And guess what? They all returned the following spring. If you are in zone 5 or warmer, snapdragons should return for you, too. Just be careful not to mistake them for weeds in spring! As for basil, see comment #41. Hi Kevin! I’m really enjoying your website!! Either I’m missing the post, or you haven’t yet shared your “fluorescent light garden.” Would love to see your set-up. Thanks for all of your wonderful information, my garden ROCKED this summer!! Hi Kevin, I already cut back my lemon verbena and hung to dry for tea, so I think I will not be able to save roots without leaves…correct? and because we were expecting frost a couple of nights ago, I also cut my lemongrass to ground and have it bundled up and am thinking I will cut the moist bottom parts off and wrap and freeze to use in soups this winter and chop and dry the tougher grassier tops for teas. Any other ideas? I live in mountains of Va. thanks! A number of people have asked about basil and it seems it’s a bit tricky – can you give a primer on the best way to attempt to keep it relatively happy? Mine is not root-bound at the moment. Should I use leaves up and then cut it all back? Cut back now? Just leave & see what happens? I took 5 potted tomatoes and two jalapeno peppers over to my friends greenhouses/storage sheds when the weather started to turn. The tomatoes had alot of green tomatoes and I hated to let them be sacrificed to the frost devils. I checked them yesterday and aside from needing a good drink everything is still looking good. We had one good frost the other night so I’m glad I took them. I’m going to try to keep them going as long as I can but the greenhouses aren’t heated so I don’t anticipate them living all winter. Thanks for the info on the overwintering our annuals, I think I’ll try that. I’m layed up for a few weeks so I have lots of time. I have a beautiful Rex Begonia “GrapeLeaf” that I bought at a lawn and garden show this past spring. It did great in my yard with partial shade, but we had such a hot dry summer that I finally brought it inside because I wasn’t able due to health problems to get outside and water things very often. It did ok in my bathroom, I have a huge “garden’ tub under a skylight so I figured it was the best place to put my “garden”!! LOL All of a sudden, all the leaves dried up and died. I’ve cleaned it up and kept it watered per the directions, but it’s very slow to come back. Everything in the tub gets quite a bit of humidity from the shower, and in the winter I keep a little water in the tub itself to provide moisture. (The plants are in saucers though) Now has 3 stalks with a leaf on the ends, shall I just leave it alone and hope for the best? Have you ever over wintered Mandevillas? If so, please provide the procedure. Many thanks. Penster47 – It seems you have given your Rex begonia everything its wants: bright light and high humidity. But if leaves are emerging only at the tips of stems, consider taking 2-inch-long cuttings from the plant. Inserted in pots of good soil, the cuttings will develop their own roots in about 6 weeks. Hi Kevin. I live in Hamilton, in Plant Hardiness Zone 6 b. Can I grow petunia and marigold seeds in January or early February in those milk-jug “greenhouses ” ? Hi Nick – It might be too late to winter-sow perennials which require stratification (alternating freezes and thaws — details here). But you can certainly winter-sow (or “spring”-sow, in this case) other perennials now. Have fun! How have I lived without you until now?? I’m glued to your website. Thank you so much. We are in zone 5a and are going on our fourth year of overwintering our rosemary. We put it in our basement and let it completely dry out (it gets pretty little purple flowers), then we give it a drink and continue ’til we put it out in the spring. We occasionally put it under our grow light that we use for our hot pepper plants. We have also continued to increase the pot size and it’s now in bucket we picked up from a nursery which is generally used for trees. Kevin, I’m new at raising house plants..Please, can I have your advice on this one..My neighbor had this beautiful red geranium that came with vinca vine in same pot. It was beautiful for her all summer and she doesn’t like house plants so she asked me if I wanted it. I had admired it all summer. Okay, I bought it home, put it in my sunroom and the geranium is still blooming up a storm but the vinca vine’s leaves have turned yellow and are falling off. Should I just cut the vinca vine way back and hope that it will bounce back nice and green or is there something else that I should do to it? My sunroom gets the morning and early afternoon sun Will that geranium bloom all winter long inside because of the sun exposure or should I cut that back? I wanted to let you know how much I have been enjoying my geraniums inside this winter! I also live in the northeast so that bit of green in this long winter has been such a pleasure! Thank you for giving us a nudge to bring our gardens indoors for the winter. Love your blog and writing! Do gazania plants bloom indoors during the winter? I’m in upstate NY and I am trying to overwinter a few types of annuals for some winter color. The pelargonium, dianthus, wax begonia, Sunpatiens and Gerbera Daisy are blooming but no sign of flowers on the gazania. Kevin, I want to thank you for your wonderful website full of advice. Last year I read about bringing plants indoors from you, and gave it a go. I know have the most full, amazing pot of overflowing lime green petunias out on my deck! I also took the double pink petunia inside (both with a severe cutback) and that is blooming as well. The lime green actually bloomed a bit during winter as well, but right now, it is stunning. I also brought in the bouganvilla (cut back, with a small cutting for insurance, which is now a baby plant) and it bloomed for me in February, so beautiful. My 3 geranium cuttings are on their way to beautiful deck plants. I can’t thank you enough as I already spend entirely too much on nursery plants every year, and this has been good on my budget, given me lovely plants blooming a bit even in winter in a southern exposure window.